In 2016 and 2017, global financial markets slowly began the process of unwinding the big quantitative easing trades that had dominated both global capital flows and performance from 2010 to 2015. QE itself only had a limited direct impact on markets, specifically by driving real yields to zero in developed bond markets. But it had a powerful second-order effect via global asset allocators, who responded by altering their allocation in favour of the QE-sponsored markets. All of the major QE trades — namely being long US stocks, US dollar, core European government bonds and, most importantly, QE-sponsored markets (developed) versus non-QE sponsored (emerging) markets — made enormous capital gains. Since late-2010 the dollar has rallied 35 per cent in broad terms and 50 per cent against EM currencies, while the total return to US stocks is 430 per cent and German bonds have made more than 80 per cent. Against such enormous capital gains, the mere yield on offer in EMs was insufficient to prevent massive outflows. Who, then, gets the biggest hangovers when the monetary punchbowl is removed? Those who imbibed the most. The slow process of monetary policy normalisation signalled by the Federal Reserve’s first rate rise in December 2015 started to unwind two of the big four QE trades. The dollar fell in both 2016 and 2017 and EMs rallied strongly as capital flowed back in. Fast-forward to 2018, and the dollar has once again rallied while EMs have pulled back. But the dynamics at play here are temporary and the unwinding of QE distortions will continue to shape global market flows for years to come. This year has been a period of interruption, not of derailment. One of the major harbingers of this interruption has been the US dollar rally, which has been driven by a large corporate tax cut, a hawkish Fed and the imposition of import tariffs. These policy interventions were specifically designed to help Republicans in November’s midterm election, but they are unlikely to have a lasting positive effect. Election-motivated fiscal giveaways typically increase macroeconomic instability, while tariffs reduce rather than enhance productivity. Neither will sustain the 2018 dollar recovery. At current valuations, the dollar looks to be about 20 per cent overvalued relative to EM currencies. This misalignment is evident in three independent economic relationships. First, a wedge of about 20 per cent to 25 per cent has emerged between real effective exchange rates in the US and EMs. Second, forward-looking growth differentials favour EMs over the US in the next five years to the tune of about 20 per cent. Third, the dollar is about 20 per cent overvalued relative to US productivity growth. Having said that, the dollar is an extremely volatile currency, and investors should not expect to realise the 20 per cent upside in EM currencies in a straight line. Interruptions, such as the one seen in 2018, will happen again. But over the medium term, the dollar will also suffer from America’s retreat from global leadership. America’s reward for sponsoring a rules-based system — comprising global conflict resolution, free trade, near-universal access to the US banking and legal systems, and the free movement of capital — was that the rest of the world willingly adopted the dollar as the medium of exchange for cross-country operations. In other words, the dollar became the pre-eminent global reserve currency. As the US now increasingly replaces rules with discretion, greater riskiness will erode the willingness of other countries to continue to use the dollar. Diversification away from the dollar will initially favour the existing special drawing rights currencies (dollar, euro, renminbi, yen, sterling) but crumbs from the big table will also over time fall on to non-SDR currencies in EMs, especially the larger currencies. With the midterm elections out of the way and dollar strength looking to subside, expect these reverse QE trades to re-manifest themselves strongly in 2019. In EM bonds, this should translate into strong performance for EM local currency markets due to the dollar’s weakness, and in EM high yield, due to spreads being well wide of historical averages. In EM equities, it should translate across the board as strong fundamentals shine through. The unwinding of these consensus QE trades will not happen overnight. Central banks will take a long time to offload assets from their balance sheet, and institutional investors will take a long time to realise that this major shift is taking place. It took them five years to put on the QE trades, so it may take another five to unwind them. But it is important to remember that short-term volatility and headwinds can do little to upend this. 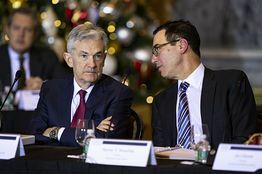 Steven Mnuchin, U.S. Treasury secretary, right, speaks with Jerome Powell, chairman of the U.S. Federal Reserve, during a Financial Stability Oversight Council meeting in Washington, D.C. last week. Behind the broad, swift market slide of 2018 is an underlying new reality: Roughly 85% of all trading is on autopilot—controlled by machines, models, or passive investing formulas, creating an unprecedented trading herd that moves in unison and is blazingly fast. That market has grown up during the long bull run, and hasn’t until now been seriously tested by a prolonged downturn. Since peaking in late September, the S&P 500 index of U.S. stocks has fallen 19.8%. The S&P is down 15% in December alone. It isn’t just stocks. Crude oil stood above $75 a barrel in October. By Christmas Eve it was below $43. Monday was the worst Christmas Eve for the Dow Jones Industrial Average in its history. To many investors, the sharp declines are symptoms of the modern market’s sensitivities. 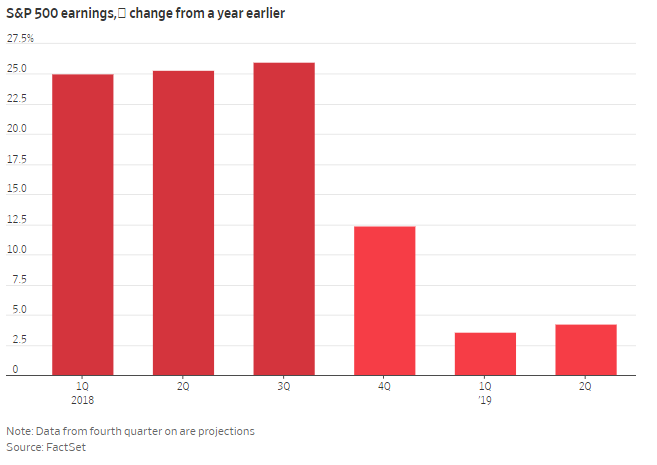 Just as cheery sentiment about the future of big technology companies drove gains through the first three-quarters of the year, so too have shifting winds brought the market low in the fourth quarter. Today, quantitative hedge funds, or those that rely on computer models rather than research and intuition, account for 28.7% of trading in the stock market, according to data from Tabb Group--a share that’s more than doubled since 2013. They now trade more than retail investors, and everyone else. Add to that passive funds, index investors, high-frequency traders, market makers, and others who aren’t buying because they have a fundamental view of a company’s prospects, and you get to around 85% of trading volume, according to Marko Kolanovic of JP Morgan . “Electronic traders are wreaking havoc in the markets,” says Leon Cooperman, the billionaire stock picker who founded hedge fund Omega Advisors. Behind the models employed by quants are algorithms, or investment recipes, that automatically buy and sell based on pre-set inputs. Lately, they’re dumping stocks, traders and investors say. Among the traders today are computers that buy and sell on models, and passive funds that seek only to hold the same securities as everyone else does. Meanwhile, bankers and brokers—once a ready source of buying and selling—have retreated. Today, when the computers start buying, everyone buys; when they sell, everyone sells. The market of 2018 is a creation years in the making, and would be hard to quickly unwind give how much is now baked into the system. Troubles in financial markets, rather than in global economies, best explain the recent market losses, argues Michael Hintze, chief executive officer of $18.1 billion London-based CQS LLP, which manages two big hedge funds that were positive for the year through November. 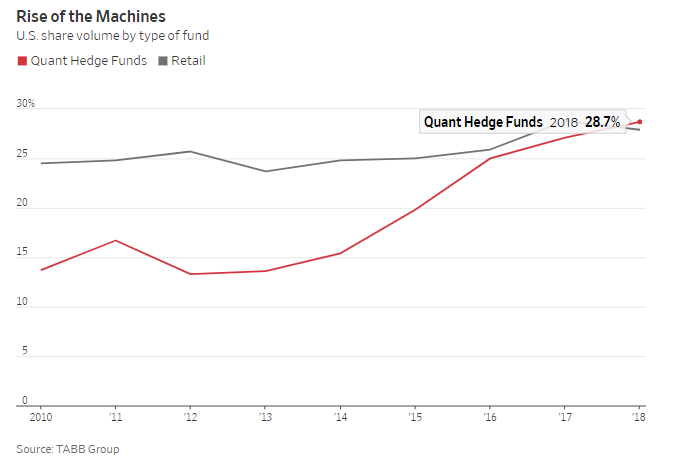 Mr. Hintze says “the market’s new structure,” featuring less trading by investment banks and more by algorithmic-focused funds, has reduced the ease with which investors can get in or out of markets. As a result, normal year-end nervousness has been amplified, and selling that in the past would have resulted in measured losses leads to deep drops. Markets were remarkably placid in recent years, even as machine trading came to dominate, suggesting that these approaches didn’t cause problems during the bull market, or even contributed to the market’s extended calm. One reason the dynamic might have changed: Many of the trading models use momentum as an input. When markets turn south, they’re programmed to sell. And if prices drop, many are programmed to sell even more. 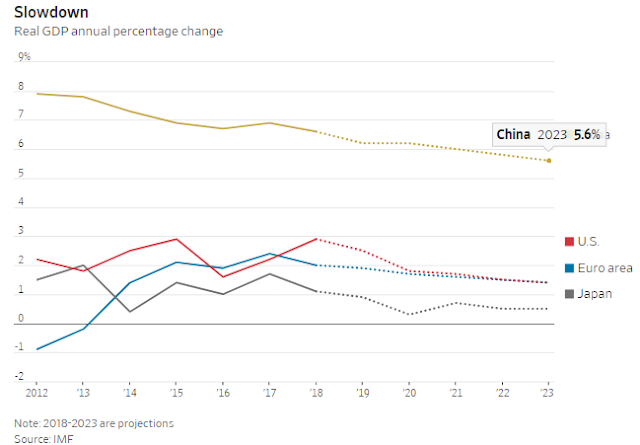 —A slowdown in growth in the economies of Japan, China and Europe, and suggestions the U.S. might be moderating a little bit too. —The end of an era of low interest rates and easy money. In late September, the Fed pushed interest rates above the rate of inflation for the first time in a decade. This month, the ECB confirmed it would end its $3 trillion bond-buying program. For investors, higher rates mean something they haven’t seen in a while: You can earn money holding cash. —A decline in the growth of corporate profits. In each of the first three quarters of the year, profits of S&P 500 companies rose about 25% from a year earlier, helped by the corporate-tax cut. According to FactSet projections, earnings growth for the S&P 500 in the fourth quarter will be less than half what it was earlier in the year. It will fall into single digits in 2019. —Erratic politics in large parts of the world. The U.S. and China are embroiled in a trade dispute. President Trump is openly denigrating the Federal Reserve on Twitter. Britain is fumbling through Brexit and Italy through an economic drought with consequences for its giant bond market. The bouts of automated selling have landed in a market ill-prepared for it. One measure of this is liquidity, the ease with which buyers can find assets to buy and sellers can find people to take assets off their hands. When liquidity declines, prospective buyers have to offer more or prospective sellers have to accept less. That makes swings in market prices bigger. It works both on the way up and on the way down. Signs of diminishing liquidity can be found all across the markets. 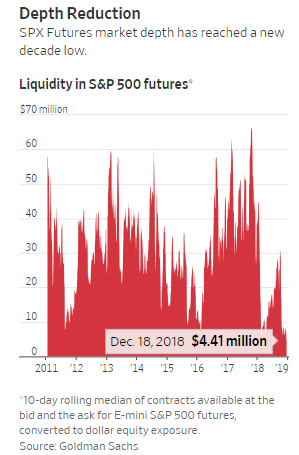 The number of contracts available to buy or sell S&P 500 futures at the best available price has dwindled in recent years and dropped 70% over the past year alone, hitting a decade low, according to Goldman Sachs. Boaz Weinstein, founder of credit hedge fund Saba Capital Management LP, said the market had been underpricing uncertainty. Now it’s taking into account political issues “at the same time as the Fed is hiking, the economy is slowing, and a lot of people are feeling like the best days for markets are over,” he said. Mr. Weinstein says there are dangers building in the junk-bond market. One worry, he says, is that so many junk bonds—he estimated about 40%—are held by mutual funds or exchange-traded funds that allow their investors to sell any day they like, even though bonds inside the funds are hard to sell. When enough investors want to cash out, such a fund has to start selling bonds. But without much liquidity, finding buyers could be hard. There are no apparent signs, analysts and portfolio managers say, of the economic imbalances that fueled the 2008 meltdown, which started with a housing bust that went on to infect the banking sector and eventually morphed into a full-fledged financial crisis. The depth and speed of the market downturn are forcing a re-examination of conditions in the global economy and comparisons to previous market downturns that took place without economic recessions. Some analysts see similarities to the late 1998 pullback in U.S. stocks that followed a year of turmoil in emerging markets, punctuated by the Asian financial crisis of 1997 and the Russian default of 1998 and culminating in the collapse of the highly leveraged Long Term Capital Management hedge fund. Others point to the market shakeout in late 2015. Like the current episode, it lacked an obvious trigger and was accompanied by anxiety over the Federal Reserve’s plans to raise interest rates—in that case, the Fed’s first rate increase in nearly a decade. Like this year, the 2015 retreat featured a sharp decline in oil prices and a significant drop in the S&P 500. In both those cases the market bounced back when investors regained confidence that the U.S. economic expansion was intact. Most U.S. economic data and surveys of consumers and businesses are still optimistic. This month, the Federal Reserve moderately lowered its median projection of next year’s economic growth from 2.5% to a still-respectable 2.3%. Markets are telegraphing a darker message. Yields on 10-year Treasury bonds have fallen from 3.24% in early November to 2.74% just before Christmas, a sign investors think the economy won’t be solid enough to make steady interest-rate increases possible. “There is a disconnect between what the financial markets are signaling about the economy and what the data are signaling,” said Catherine Mann, chief global economist at Citigroup. Those sirens also include large drops in commodities like oil and copper, which hint at slowing global demand, and stress in the corporate-bond market. The spread between riskier high-yield debt and Treasury bonds widened to five percentage points from three percentage points in early October. Spreads moved at similar ranges between July and November 2007, one month before the most recent recession began. Sentiment among chief financial officers, who help set budgets that will shape investment and hiring decisions, has also soured. Half of CFOs believe a recession will start within a year, and 80% think a recession will hit by the end of 2020, according to a Duke University survey. Encouraged by signs of economic strengthening, the Fed has been gradually raising interest rates from rock-bottom levels and selling back the trillions of dollars in bonds it bought in the postcrisis years. The central bank says the roll-back of stimulus is smooth. Others aren’t so sure what comes next. There has never been such a huge stimulus, and one has never before been unraveled. Some believe there's a hidden risk in debt that consumers and companies took on when borrowing was inexpensive. The Fed’s campaigns were “fundamentally designed to encourage corporate America to lever up, which makes them more vulnerable to rising borrowing costs,” said Scott Minerd, chief investment officer at Guggenheim Partners. “The reversing of the process is actually more powerful,” he said. If The Fundamentals Are Still Bullish, Why Is The Market Crashing? - I am still seeing analysts suggesting the fundamentals do not support this market decline. - Market sentiment has driven this market decline, as it has nothing to do with fundamentals. - I am still looking lower in the coming weeks. I would not have had to invest or work at all if I had $100 for every time I heard an analyst tell me that the market is just not trading upon fundamentals at this time. In fact, when the market seems to disconnect from the fundamentals, analysts view it as the market being wrong. But, isn't it my responsibility as an investor to align my investment account with the market rather than the "fundamentals?" So, I would much rather be wrong and profitable rather than be right and in the red. Take a step back and think about this. When the market was hitting its low in 2009, were the fundamentals bearish or bullish? I think we all can reasonably recognize that the fundamentals were extremely bearish as the market was hitting its lows in 2009, with expectations of further lows to come. Yet, that is exactly when the market struck a very long-term bottom and began the bull market within which we now find ourselves (yes, I only consider this a correction within a larger bull market off the 2009 lows). How was it possible that the market turned higher and began a major multi-year bull market when the fundamentals are so bearish? Well, if you understand that market sentiment leads fundamentals then you will understand how this can happen. You see, markets bottom when there is no one left to sell (when bearishness reaches a climax), and markets top when there is no one left to buy (when bullishness reaches a climax). It really is as simply as that. Yet, the fundamentals lag these stock market events by many months. This is why we often see markets top on good fundamentals and bottom on negative fundamentals. And, I have explained this perspective in prior articles. So, as many analysts hold fast to their bullish perspective based upon the fundamentals, we will likely not strike a long-term bottom just yet. 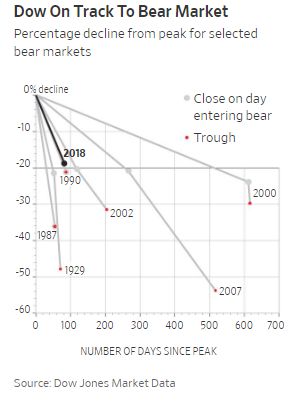 In fact, my work, along with Professor Douglas's suggests that they, along with a majority of market participants, will have to turn extremely bearish in order for us to strike the bottom to this correction. Therefore, as long as we continue to see the majority of articles explaining to us that the fundamentals still remain bullish, we will not likely strike a bottom. And, by the time we do reach my long-term target in the 2100-2200 region for this correction, many of the “fundamentals” will likely have turned bearish. The question many are now trying to answer is what the “cause” of this drop seems to be, especially with many viewing the fundamentals of the market as still being strong? It seems that some are questioning whether it was the Fed that caused this recent decline. But, the Fed has been quite transparent about its intentions and there were no surprises in the recent Fed action, therefore there was nothing new presented to the market which should have caused such a negative selling loop. "Responding to a question about quantitative tightening, Powell said that the Fed's balance sheet runoff is on autopilot - and that really seemed to spook investors," Ristuben said, adding that he found the strong reaction somewhat surprising. "Both Powell and former Fed Chair Janet Yellen have previously talked about shrinking the balance sheet (by up to $50 billion a month) in automatic fashion," he noted. So, is it the Fed or is it not? I think Mr. Ristuben is joining the rest of the market in scratching their collective heads as to what the true cause of this decline has been, especially since he dismisses the government closure as a cause. (And, if you disagree with Mr. Ristuben regarding the government closure, I addressed this issue last week). "Severe market declines defy logical explanation - but that doesn't stop the punditry from trying!" Anyone following my analysis should not be surprised by this reaction in the market. In fact, the members of The Market Pinball Wizard were prepared for this decline well before it took hold, as I noted in our chat that I was going to cash when 2880SPX broke. The main reason why so many have been caught looking the wrong way recently is because they do not realize that the market does not need a “cause.” The market will do what it will do based purely upon market sentiment. Unless you have a deeper understanding of market sentiment, this decline probably caught you by surprise and has you scratching your head too. When the cause of a market decline is clear based upon current events, pundits are easily able to present their superficial exogenous causation theories of market movement. "Turning the market into the decisions of “investors” and attaching a reason makes for a simple story. So does describing a game between bulls and bears. Both are simplistic and unhelpful for genuine analysis." But, when there is no clear cause, we see much head scratching, especially when the fundamentals are still strong. Befuddlement regarding this decline seems to be the perspective of the day, as this decline seems to have caught many by surprise. So, you are clearly not alone. "Currently, while I had wanted to see a larger rally take us above 2800 before we saw a bigger decline in the market, we are seeing signs that the rally to 2815 may have been all we see. Market resistance is now at 2635-55, followed by 2720. Unless the market can exceed those levels, and soon, we actually have a set up in place now to drop below the 2400-50 support I had wanted to see hold before a bigger rally takes hold. And, if this pattern triggers in the coming weeks, it will “feel” like a crash to many as we enter 2019. As always, we will be tracking this set up in The Market Pinball Wizard as it continues to develop, and I have added a very detailed analysis this past weekend on what I am seeing in the market"
In the near term, the 2520-50SPX region is our new main area of resistance. As long as we remain below that resistance, the market will likely subdivide towards the 2250/2335SPX region next, and we will continue to move our resistance points down as we continue to decline. In fact, that may even provide us with a bottom and kick off a strong rally. But, there are many factors I will be watching in order to make this determination, as outlined in my weekend update this past weekend. So, while many investors are stuck in long positions since they did not recognize that the market environment was changing, we have been quite focused on the 2100-2200SPX region as a target for this long-term correction even before this correction began. And, while we may still see a corrective rally in 2019 which can take the market back to 2800+ before that downside target is met, our long-term expectations remain focused on that 2100-2200 region for this correction before we are able to set up for the next major rally in the 5th wave off the 2009 lows, with targets over 3200SPX in the coming years. And, should we see indications of bottoming in our target zone, I will probably attempt a long trade for that potential corrective rally. However you slice it, 2019 will be providing us with a lot of opportunity. Placating the protesters could mean violating an EU budget rule – and compromising France’s leadership on the Continent. Emmanuel Macron is facing some serious problems, and they don’t all involve yellow vests. 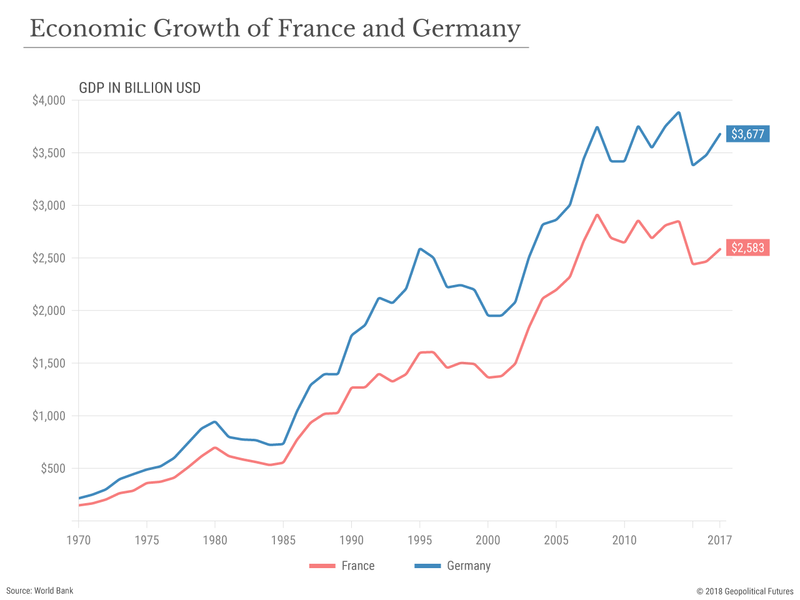 The past decade has been the worst for France’s economy in at least 60 years. Annual gross domestic product growth has exceeded 1.2 percent only three times since 2007. Unemployment in the wake of the 2008 global recession and European debt crisis didn’t peak until 2015, and it had fallen only to 8.9 percent by October 2018, giving France the fourth-highest unemployment rate in the European Union. (Youth unemployment was much higher at 21.5 percent.) But the biggest problem of all – one that’s been clear since 1990 and worsened since 2008 – is that France is falling behind Germany, its closest partner in the European project. The French president’s greatest challenge, and much of the motivation behind his drive for reforms at both the domestic and European level, is closing this gap. Macron, who served as economy minister from 2014 to 2016, ran in the 2017 presidential election as a change-maker. He made all the usual promises – to restore economic growth, create jobs, invest in the future – and to his European partners, he promised to do it all while leading the first French government since 2007 to obey EU budget rules. In his first 19 months, he passed extensive labor market reforms, making it easier for employers to dismiss workers, streamlining contract negotiations and beefing up vocational training programs. He cut taxes, mostly to the benefit of the wealthy and corporations. In search of new revenue, he instituted taxes on cigarettes and fuel. All the while, his approval ratings tumbled from the mid-50s to the mid-20s. His labor reforms, in particular, set off waves of strikes and street protests. But it was the fuel tax that really galvanized his critics. The “gilets jaunes,” or yellow vests, movement was initially a rural phenomenon, but rapidly broadened to include the full spectrum of Macron’s critics. In early December, after the third weekend of yellow vest protests, the government delayed implementation of and then outright canceled the fuel tax. But the protests continued, and after the fourth weekend, Macron gave a televised address offering concessions (including a minimum wage hike and further tax relief). By the fifth week, however, the protest movement had visibly lost steam, and this past weekend its numbers further dwindled. Macron vowed to stay the course on his overall reform agenda, but he did so at the cost of breaking his pledge to obey EU budget rules. The EU’s Stability and Growth Pact requires that governments maintain an annual budget deficit of less than 3 percent. The 2019 French budget was already teetering on the edge, at 2.8 percent, but the concessions to the yellow vests will push the deficit to at least 3.2 percent. While it’s true that France has never much cared about this rule, Macron wanted to be a different kind of French president. Macron has framed himself as Europe’s defender against euroskepticism, populism and nationalism. It doesn’t help his image as the hero of Europe if his own government steamrolls Brussels on its domestic budget. France’s strategy in Western Europe, as it has been since World War II, is to preserve a balance of power with Germany through integration. Macron’s original goal was to create a fiscal union and eurozone finance minister, hoping to put centralized authority in a figure more amenable to French control. German Chancellor Angela Merkel quickly tempered those ambitions, and in the end, Merkel and Macron settled on a small shared budget for eurozone members (much smaller than France had hoped and lacking the ability to assist countries during downturns), a larger backstop for European banks, and little else. As Europe’s largest economy, Germany is the de facto gatekeeper of eurozone reform. Without Berlin’s buy-in, Paris’ proposals will go nowhere. But getting Berlin on board is an uphill battle. (In late 2012, during the eurozone crisis, a eurozone budget was suggested. Merkel shot the idea down with the question, “But where is the money supposed to come from?”) Life is pretty good for the Germans at the moment, and it’s not easy to convince people who are mostly content that things need to change. Moreover, the Germans know that when their government assumes more of the European burden, citizens disproportionately bear the cost. For Macron, securing German support was always a difficult prospect; but until France instituted structural reforms and demonstrated what Berlin deemed sufficient respect for EU rules, winning Germany’s support would be impossible. To be sure, the Germans need the eurozone to survive every bit as much as the French do. Should a recession send Europe spiraling into another crisis, Berlin would almost certainly come to the rescue as it did before. But German politics have changed a good deal since 2012, with the rise of the euroskeptic Alternative for Germany party (now Germany’s third- or fourth-largest party, depending on the poll) and concomitant shift to the right within its largest party, the Christian Democrats. Germany’s reluctance to put up its money last time, and the conditions it attached to its help, did tremendous damage to the image of liberalism and democracy in the EU from which the bloc still has not recovered. It’s not a cycle Paris wants to relive, especially given that France could someday find itself in need of aid. Germany wouldn’t try with France what it did with Greece, but neither would it give a no-strings-attached bailout – and that’s assuming France could be saved. So, if he wants to enact eurozone reforms before the next crisis hits, all Macron needs to do is the near-impossible. By the end of Germany’s Agenda 2010 reforms, the country had broken the now-sacrosanct 3 percent deficit rule for five straight years. Germany’s budget deficit soared to 4.18 percent; France’s projected 2019 deficit of 3.2 percent is ascetic by comparison. Now that the yellow vest protesters have seen their efforts pay off, and with Macron’s tanking approval numbers, France’s compliance with the rule may not be possible. The biggest obstacle to France’s ability to get back on the right side of the rules, however, is the European economic slowdown and impending recession. The momentum the Macron government had built up in domestic reforms was impeded by the yellow vests. That means Germany’s support for eurozone reform will not be forthcoming – and it was always a bit of a long shot that Germany, with of its own domestic political instability, would willingly go along with Macron’s reforms anyway. France will keep playing catch-up, while Germany keeps writing the rules.